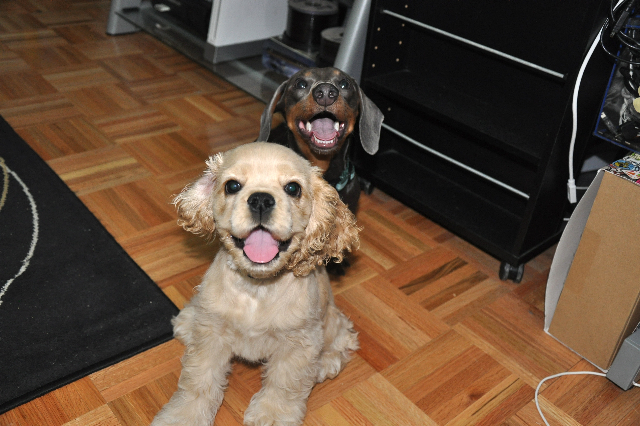 In early May, when I brought home my new cocker spaniel puppy, Lucy, there was one thing I was determined to do–socialize her the right way! Why? 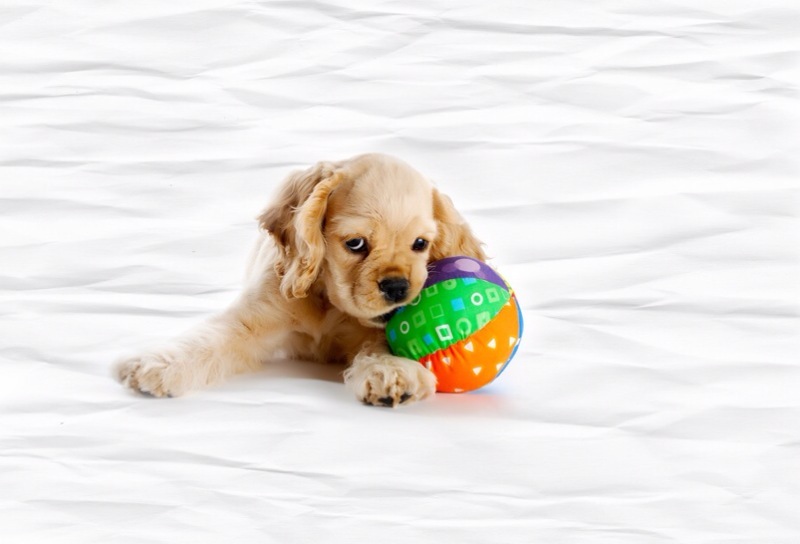 Because the first 16 weeks of a dog’s life are crucial–the window of time in our puppy’s lives that determines who they will become as adults, how they react to strangers young and old, kids, all kinds of dogs, and the environment in which they live. 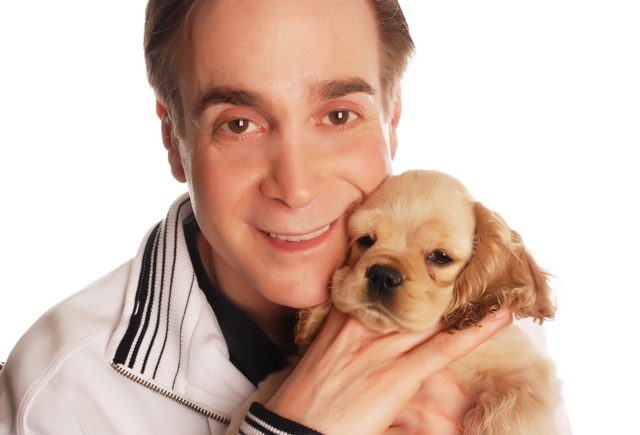 For me, the sights, sounds, smells, tastes, and touch of our little waterside community in Battery Park City–with its more than 700 dogs–is the perfect training ground for any puppy, a circus and dog show rolled into one. In short, it’s the ideal place to socialize a puppy, desensitizing a dog to all the stimulation of city life–traffic, garbage trucks, sirens, elevators, fountains, blaring music, fireworks, the sound of the waves, the hoofs of a police horse, golf carts, any and everything. So, after four weeks on the job, Lucy isn’t bothered by any of it. She loves watching the birds and squirrels and she doesn’t flinch at screaming babies or noisy kids. She’s intrigued by the grass and blowing leaves. And vitally important, she adores dogs of every shape and size. She rubs noses with majestic Great Danes and pint-sized pugs. She chases Golden retrievers and Labs. One German shephered in the neighborhood named Jake, renowned for his “singing,” croons to Lucy. She chases boxers, Yorkies, poodles, and Boston terriers. 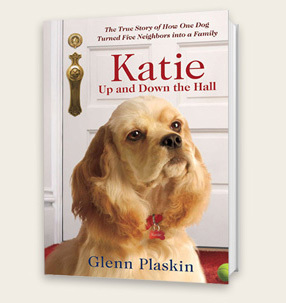 Thinking back, there was a time when the heroine of my book, KATIE, was withdrawn from most other dogs, most interested in humans and I never understood why, until I read some articles about socializing dogs. Now I see that it was because I never actively exposed her to dogs during the first 16 weeks. 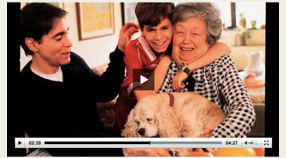 So throughout her lifetime, she was somewhat aloof to all dogs except the few she knew. I can tell you that she has been passed into the arms of countless strangers since she arrived here in the Battery. Anyone who stops to admire her incredible cuteness gets a hug and a kiss. She’s permiscuous to a fault and kisses anybody she meets. She’s had her picture taken with tourists lonesome for their own dogs; she crawls into baby strollers and snuggles with new-borns; she chases elementary school kids, attempting to undo their shoelaces; she tackles 90-pound dogs and playfully whacks them in the face with her paws, biting their ears. On one recent night, she found a huge dog and got a good grip with her mouth on his long bushy tail and wouldn’t let go! He gave her a wild ride, whirling around and around, and I’ve never seen her happier, her tongue hanging out with pleasure. The encounter ended with her putting her entire head in his mouth. Not a bruise. And of course, she socializes daily with her “regulars,” our neighbor Mike and his pug Duchess, Brandon and his Bijon Frise Fred, Ben and his two Shih Tzus Mico and Sammy, Maria and her Wheaten terrier, Norma, and most important, Elisha and Raffi’s adorable dachshund STANLEY. This has become a special connection. Lucy and Stanley, who both live on the same floor in our 35-story building, are in LOVE! Boyfriend and girlfriend, they adore adore each other and race up and down the hall just as Katie used to with blinding speed. Lucy is voracious for these whirwind runs. And when they play inside the apartment together, the action goes on for hours, until they both collapse for naps. It gives ME such pleasure to see my puppy so happy, so healthy, so well-exercised and socialized.So while many dogs in our neighborhood are skittish and afraid of their canine compatriots, literally clueless about how to appropriately “play” with another dog, thankfully, my bouncy spaniel is filled with curiosity, eager to strut along the Esplanade–finding new canine pals wherever she goes–sniffing, licking, circling, jumping, racing around, eager to have some fun. As for me, I’ve lost 12 pounds exercising. It just goes to show you what incredible cuteness can do for you. And not least important, Lucy has helped socialize ME, as all dogs do. I’ve never had so many new human and canine friends. I’m virtually never alone when I’m outside, not for a minute. All kinds of people come up to me to talk and to pet my dog. Fellow dog owners have given me dog toys and books about training a puppy, late night visits for housebreaking tips, shared dinners out by the Hudson, you name it. One night, when I was in a panic about having bitten off more than I could chew training a puppy, two kind friends, Helen Lee, Mike and their pug, Duchess, stopped by to cheer me up and cheer me on. Who could ask for anything more? And it’s all because of one incredible cocker spaniel named LUCY. For anyone who would like to meet Lucy in person, please join us on September 16 at Barnes & Noble Tribeca, a book signing for KATIE UP AND DOWN THE HALL, hosted by Liz Smith. What a great post, Glenn! Miss Lucy is socializing everyone here =) Stanley looks forward to their dates every day! 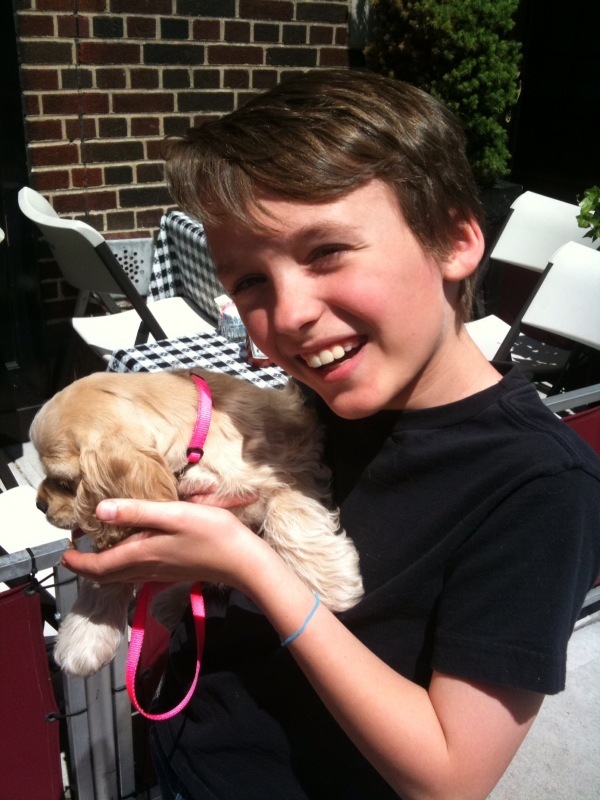 It was such a pleasure meeting you and Lucy for the first time on our stroll in Battery Park the other day! After reading your website and the above article, we realized we were two of the lucky recepients of your kindness and Lucy’s social skills 🙂 She reminded me of my childhood puppy, Daisy May, a stray cocker we adopted and brought into our home. Your willingness to share and be a trusting friend brought back that feeling of family and community that is so easily lost in this cement jungle; it reminded me of home and how I want to be with every new face I meet. Thank you, again, and we look forward to keeping in touch and your new book release!